GWTW Forum > Kites! Kites! Kites! > Sport Kites > Vented? What wind could you say is enjoyable with the different vented kites? I stop enjoying my regular kites as the wind picks up and you have to start moving rather quickly to do any slack line tricks. Would a vented let you do the same tricks in higher wind? I'm asking because its either been really windy/gusty or no wind at all lately in my area. I'm not mentioning specific wind ranges - you can check the manufacturers sites for that (for what they are worth). The thing with flying in high wind is that you definitely need to be using long lines - the longer, the better. It gives you more time to react and due to the larger window, seems to slow the kite down in a sense. Trying to fly a kite in 20mph of wind with 65' lines is going to be MUCH harder than the same kite on 120' lines. It seems obvious, but I see folks folks flying with short lines in high winds all the time. how about line sets? what weight lines? I am also tempted to throw my hat in the 'heavy standard' ring. I have had a number of vented kites that did surprising little to make flying in the gusty stuff more fun, and all those are gone. I have a couple self modded heavies, and they still get air time. Believe it or not, I too think Lam makes a great vented kite. The reason I think his kites work is because his vents are TINY. A full vent SD has 8 or 10 vents (depending on your model), and they are all VERY SMALL. They might be 5% of the total sail area, and certainly no more than 10%. Christiaan Derefat also makes his vented kites with relatively small vents. The best one of his I have flown was a Neutron with maybe 50 coin sized holes. That kite ruled. The bigger vents often lead to all sorts of serious performance changes (which are usually undesirable). An example from my experience would be the XTS variable vented. Not only is this kite HEAVILY built (8P spreaders, etc. ), but fully open I'd guess you lose 40% of the sail area. This kite hates to fade, and just falls nose down right back out. Another would be the SD vented. I grew to like my standard with the 7PT spreaders taken from the vented combined with my air brakes better than I did the SD vented. I would guess that the better you get, the more likely you are to have LESS vented kites...maybe zero. I have had as many as three, a total of 5, and own none now. I think as you progress as a flier, you'll learn how to keep to the corners, or how to pick your flying days better to avoid the obnoxious winds. Even though I have different sets of line, I always use the 55Kg/100ft line set from low wind to high wind. My 50lb/80ft set is brand new, 150lb/110ft used once or twice only. I guess I'm too lazy to change flying line. Call me crazy, but use 90# up to mid 20s at various lengths - I like to hear LPG lines sing! I have a 300 lb 120 ft set I really like to use in high winds. That high of a pound test rating is of course not needed but its my only 120 ft set. Interestingly its on Sky Claws because I've had the set since 1992. The Sky Claws work fine because I enjoy flying rather than tricking in strong winds. For tricking with my vented QP I use 150 lb 85 ft, but then I give up trying to trick in anything over 15. This is why the VV almost never sees airtime. the QP std tricks way better and is fine up to 15. I like to hear LPG lines sing! I bet I can use the LPG in a violin as strings or replacing the horse's tail hair in the bow. I think it will make wonderful music. If you want light pull and good trick capability similar to the standard version, I'd recommend the vented Soul. It is the only vented kite I have bought and NOT sold soon after. I haven't flown the vented Talon, but I've only heard good reports about it. If the winds get ballistic, you can always come over to the dark side and fly a vented Rev 1.5. What Obi said about the smaller vents makes sense to me. I have 4 vented kites, a QPro VV (good & tough), a Mantis V2 (currently out on loan, I never clicked with it), a Nebula vented (awesome kite for 7-15mph), and the FVL (I'm quickly learning to love this one, really flies in 3-20mph with ease). 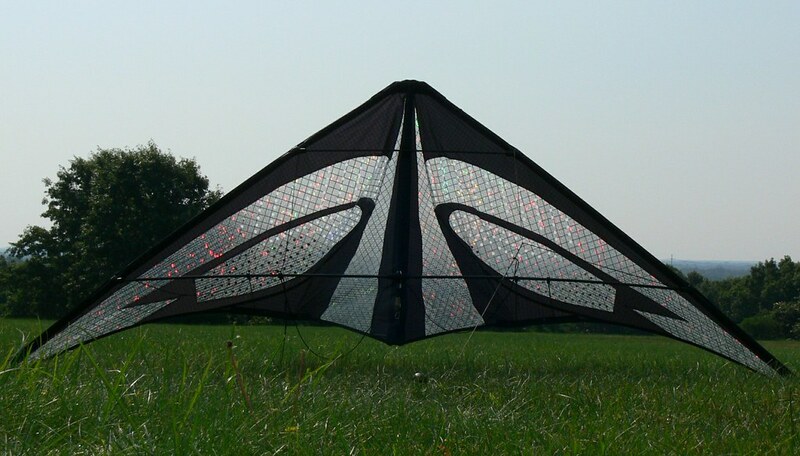 The Nebula vented has probably 100 3/8" holes in it, and you can't tell that you're even flying a vented kite, flies just like a standard, except less pull and higher range. It was rated up to 25mph, but it gets too fast for me above 15mph. Bang for the buck, I don't think you can beat the Nebula vent. sheesh! How did Reg cut all those tiny holes? It depends on the kite - heavy lines work on kites with a firm pull but not on lighter pulling kites. So for a comp style vent which still pulls but you're concentrating on controlling speed, 300lb lines add some drag to slow things down. My 300's are very fat so a better quality 500 would probably be the same. For a trick oriented light pulling vent 150lb max probably. This Nebula was made by Erv Crosby, before Reggie took over Four Winds. My best guess is that he used some sort of a punch to cut them.